Having children means providing them them outdoor activities. If you have a yard, getting some play equipment can provide hours of entertainment for your children. One of the simplest equipment that children can play on is a seesaw. 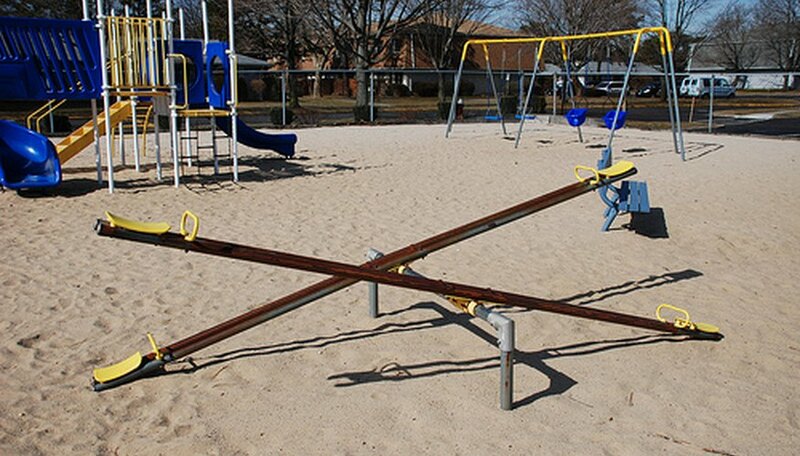 If you have some basic tools, you can build your own seesaw. Before you know it, your children will have another outlet for their energy. For this project you will need two 2-by-8-inch boards cut to a length of 9 feet. You will also need two pieces of 4-by-4 posts about 5-feet, 2- inches long, two lengths of rope 24-inches long, a 24-inch long, 1-inch diameter galvanized steel pipe, jig-saw, drill with 1-inch bit and 3/8-inch bit, four 5-inch long 3/8-inch carriage bolts, four washers, four nuts, cement mix and a post hole digger. Make sure you have enough a room in your back yard for your seesaw. For these plans, allow at least 10 feet of space free from any debris. First dig holes for the posts roughly in the center of your space. Use the post hole digger to dig two holes that are 18 inches deep and 8 inches apart. Once the holes are dug, mix the cement with water until it's the consistency of wet mud. Place the 4-by-4 posts in the holes and fill the holes with cement. Use a level and make sure the posts are plumb in all directions. Let the cement dry. While the cement is drying, prepare the seating planks. Clamp the 2-by-8-inch boards together so the ends are even. Using your 1-inch drill bit, drill a hole in the center of the board where the boards come together. You should have a half-inch half-circle notch in each board. This is where the pipe will go when the seesaw is assembled. Once the cement has dried, drill the holes for the pipe in the posts. Measure one inch down from the top of the post and make a mark. At this mark, use the 1-inch drill bit to drill through the center of both posts. Place the pipe through the holes so it goes through both posts. Clamp your planks around the pipe so it fits in the notches and drill two holes through the boards on either side of the pipe (four altogether) with the 3/8-inch bit. This is where the planks will attach to the pipe. Place the carriage bolts in these holes and use the nuts to attach them to the wood. Carriage bolts are better than screws because they provide more strength. At 18 inches from either end of the boards, drill two parallel holes through the boards; run the rope through and tie it to form a handle on each end.